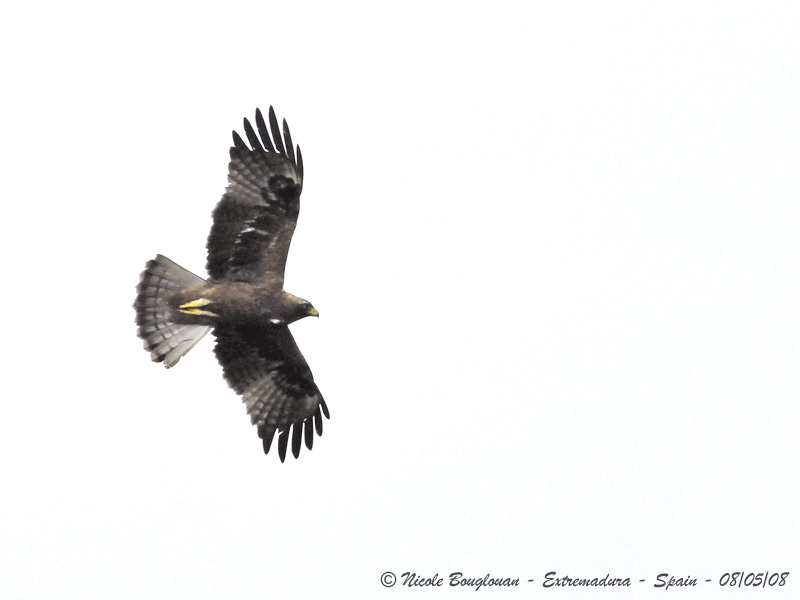 The Booted Eagle shows dark and light morphs. The dark morph is the less common. Head and neck are pale brown streaked darker brown. Forehead is white. The upperparts are dark brown with paler uppertail feathers. The tail is pale ochre, with dark greyish-brown edges. The underparts are blackish-brown, except the greyish-brown tail. Tarsi are well feathered, often brown, sometimes paler. 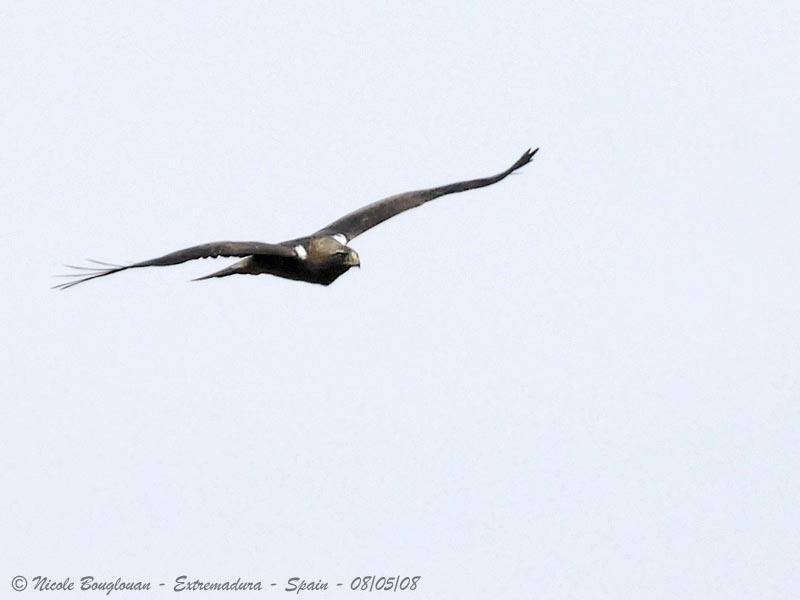 The Booted Eagle in dark morph is very similar to the Black Kite (Milvus migrans). In light morph, the tarsi show white feathers. The upperparts are dark grey. The underparts are white, more or less pale rufous and streaked. The head is pale rufous and streaked. In flight, we can see a pale band on the dark upperwing. The underwing is pale with black flight feathers. The immature resembles adults, mainly in dark morph. It has more rufous underparts, with dusky streaks. The head is reddish. When the courtship displays start, the Booted Eagle male call insistently “pi-piiii”, and as to express its anxiety, it repeats “pi-pi-pi-piiii”. At nest, both sexes utter “klia-klia-klia-ki-ki”. 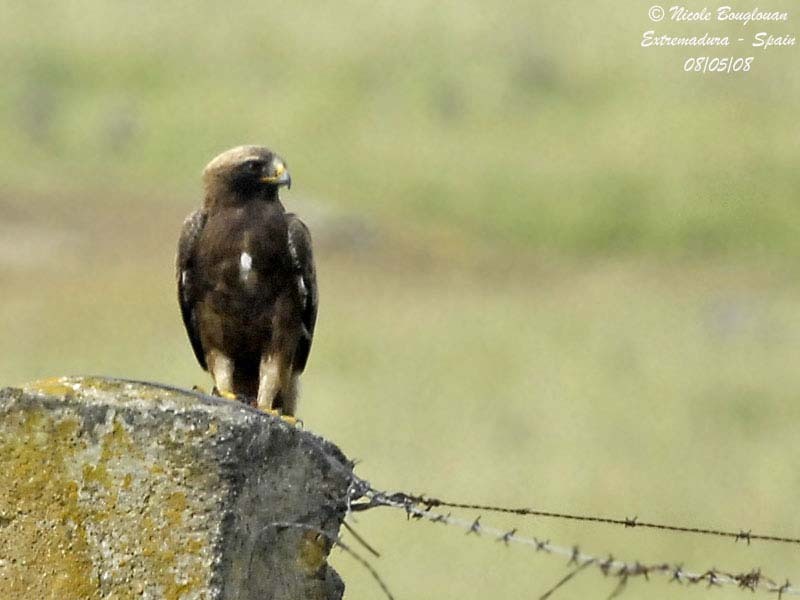 Booted Eagle breeds mainly in mountainous areas with forests and open lands. Forests may be broad-leaved or conifers, or both, or with palm or olive trees, particularly in Morocco. It also frequents flat lands, mountainous slopes or low hills. This species is also visible up to 2000 and 3000 metres of elevation, according to the range. 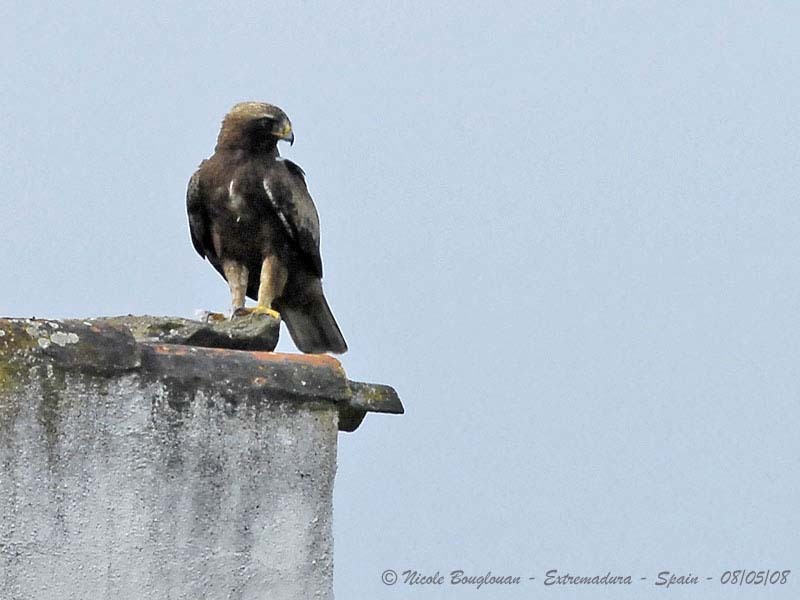 The Booted Eagle breeds in southern Europe, from Spain and eastern Portugal, North Africa and southern Asia, to Japan. It winters in Africa and India. The Booted Eagle hunts in clearings. It soars fairly high, circling, and when the prey is detected, it dives almost to the ground where it straightens up and raises slightly. Then, it flies swiftly with the talons held forwards, in order to catch any small bird on the ground or flying low. It may capture rabbits and lizards in the same way. It also lies in wait at the edge of an open area. It catches insects while walking. It also may take eggs and chicks in other species’ nests. The flight displays are spectacular. 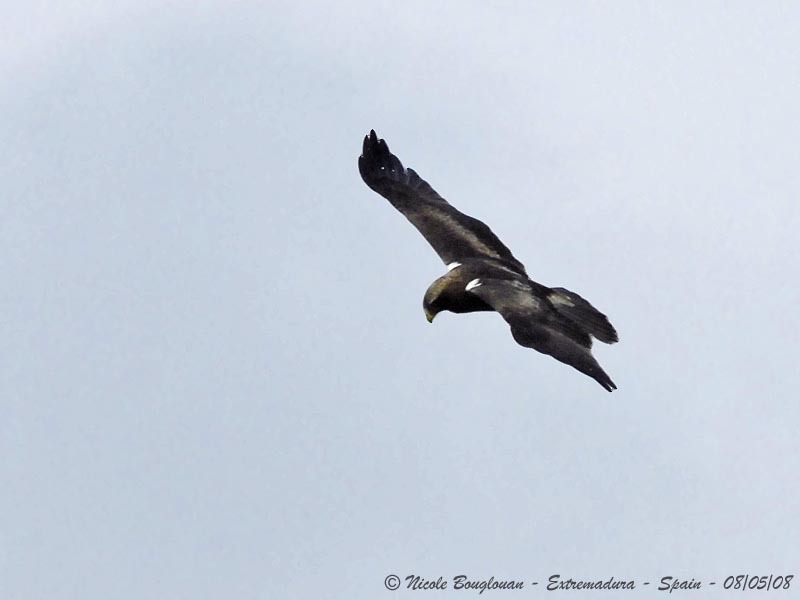 The eagles soars in narrow circles above the forest, abruptly dive at treetop level, and then, they soar lower above a wide area and rise again with almost motionless wings. When the reproduction starts, both adults fly above the forest, calling loudly. Outside the display period, both mates often fly together. Pair bonds last all the life. They usually reuse the same nest-site every year. During the winter, these raptors live more solitary, and they gather again in the early spring for courtship displays. 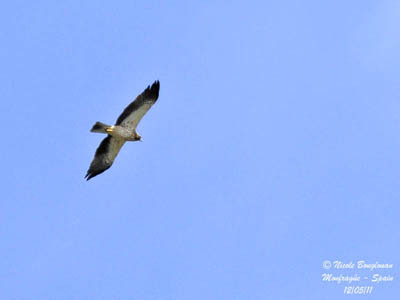 The Booted Eagle is mainly migratory, leaving the breeding areas in September, and coming back in March-April. The Booted Eagle always flies and soars above the trees. It spends most of the time in the air. The Booted Eagles nest fairly close to each other, and they do not defend any territory. Usually, the nest is built in a tree, in thickets or in isolated tree. In some parts of the range, as in Africa, they may nest on ledges, or in small trees on cliff faces. The nest is large, with 70 cm of diameter and 30 cm of thickness. It is made with sticks and twigs, and lined with green leaves, renewed during the nesting period. The female usually lays two eggs, at two or three days intervals. Incubation lasts about 37 to 40 days, by female. She is fed by the male during the entire period and even several days more. In this species, the chicks grow rapidly. The first feathers appear at 20 days, and the complete plumage at 40 days of age. They leave the nest at about 50 to 55 days of age. They are fed by both parents near the nest during about 40 days more. Usually, both young survive. The Booted Eagle feeds mainly on small and medium-sized birds, small mammals such as mice, reptiles such as lizards, and large insects. It is able to hunt as in open or wooded areas, and sometimes, both mates hunt together. The Booted eagle’s populations seem to be stable, in spite of the threat by habitat loss due to deforestation in some parts of the range, human persecutions, and the decrease of its favourite preys.